While many travelers visit Hong Kong every year, few make it over to the sister city of Macau. 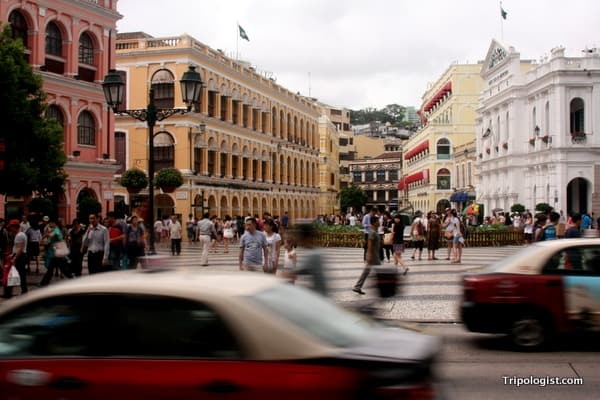 An easy day trip from Hong Kong thanks to ferries that run 24-hours a day, the Macau Peninsula offers visitors a fantastic array of attractions in an easily walkable city. What makes Macau (also spelled Macao) so special is the huge influence that the Portuguese had on the look and feel of Macau. And, even though the city is now under Chinese rule, you’ll still see more Portuguese writing than English when walking around. While, you could spend more time in this compact city, taking a day trip to Macau from Hong Kong is the most popular way to see the city. Marveling at the facade of Sao Paulo Church is one of the top things to do in Macau. 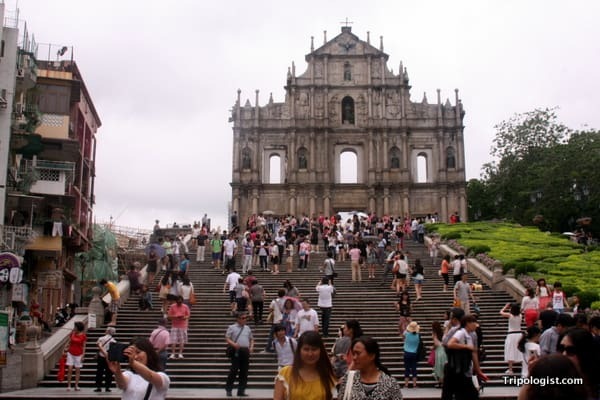 If there is an iconic image of Macau, it is the facade of San Paulo Church. The church was constructed in the 17th century, but burned down in 1835 leaving only the beautiful facade. Called a “Bible for the poor” or a “sermon in stone”, the facade of Sao Paulo Church is a must-see for any visitor to Macau. If you walk through the old entrance to the church you can also see some of the ruins and graves that used to belong to the building. 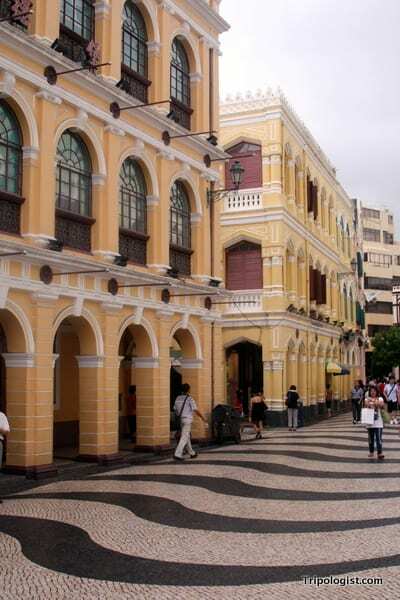 Make sure to take a stroll through Largo de Senado while in Macau. While Macau retains much of the charming architecture from its colonial past, nowhere is this more evident than in Largo de Senado. Pastel colored buildings line the square, and the unique black and white waves of the cobblestone make the square feel alive. This area is considered the hub of Macau and a stroll through the surrounding streets allows you to experience some of the city’s most beautiful spots. 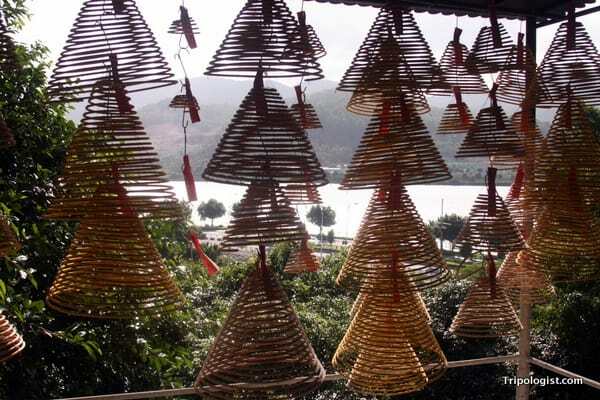 Incense coils hang in A-ma Temple on the Macau Peninsula. Situated on the southwestern corner of the peninsula is A-ma Temple. Built in 1488, this Taoist temple predates the Portuguese and is dedicated to the Tao god of seafarers. Set in a beautiful seaside location, this temple is a hub of activity and smells strongly of incense thanks to the many incense coils that cover the temple. Don’t miss Mandarin’s House when you visit Macau. 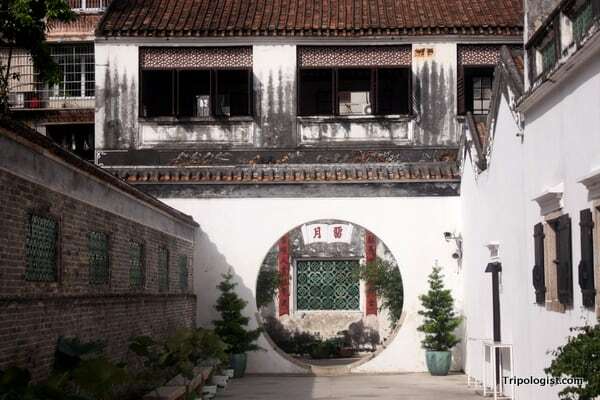 Built in the late-1800s, Mandarin’s House is a 4,000 square foot complex that was designed as a residence for the regionally well-known philosopher Zheng Guanying. Today, it’s possible to walk through this maze of buildings to see this large, but traditional, Chinese house. The size of the house is in stark contrast to the rest of Macau, which is the most densely populated country in the world. Even if you don’t know who Zheng Guanying is, visiting his house is a great way to explore Chinese architecture. 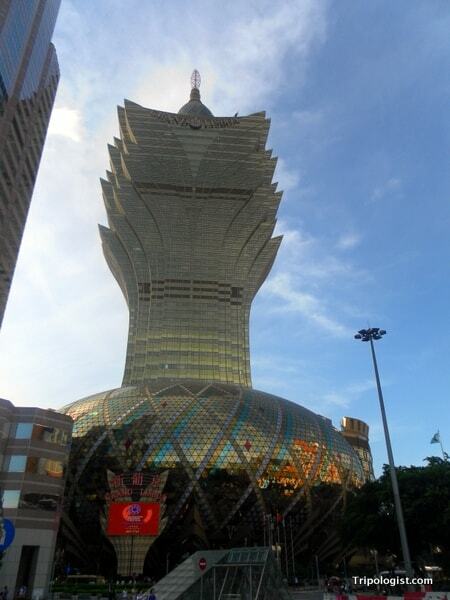 The gaudy Grand Lisboa Casino is a great place to discover the heart of Macau’s economy. While Las Vegas may be more well-known, Macau is actually the gambling capital of the world, taking in more revenue than its American counterpart. So, it makes sense that any day in Macau should end with a bit of casino time. While it may not be the newest casino in town, the Grand Lisboa is certainly the most visible. Towering above the surrounding buildings, the golden fan-shape of the Grand Lisboa is visible from nearly every vantage point on the peninsula. Even if gambling isn’t your thing, walking through one of the city’s many casinos is one of the best ways to experience Macau. Have you been to the city? What are your favorite things to do in Macau? Let me know in the comments section below. Wow – neat. I’ve heard a lot about the city, but have never seen any photos. Would love to make it there one day. Macau is a great place to visit. While I’m sure you could spend much longer there, you can see the highlights in a day trip from Hong Kong. It’s so easy to get there from Hong Kong, there’s no reason not to go.